Image Courtesy Charles Pettaway via TwitterLil Wayne and Mannie Fresh were together in the studio over the weekend, raising speculation that they are recording for the first time since they collaborated ten years ago on Weezy’s 2004 album Tha Carter. Wayne is now completing Tha Carter V, but there is no word on whether Fresh is contributing to that CD. 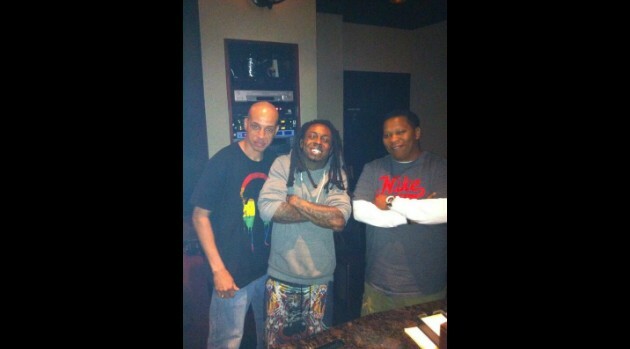 Producer Charles Pettaway tweeted the photo of himself with Wayne and Fresh. He recorded with Fresh in the past on the 2004 solo CD The Mind of Mannie Fresh and also the 2003 Big Tymers CD Big Money Heavy Weights. Fresh has been in negotiations with Birdman to work again with Cash Money, and there has been talk of a Big Tymers reunion. Fresh was an in-house producer for Cash Money Records for 12 years but left in 2005 due to financial reasons and signed with Def Jam.